Apple has officially launched the latest update of the most advanced mobile operating system, iOS 12, on Monday, which it should be stable than iOS 11. However, the adoption rate doesn't look like sharp at all, in fact, it saw an even slower adoption rate compared to iOS 11 and iOS 12. After 48 hours since it was released to users, it was only installed 10% of devices, according to analytics company Mixpanel. Mixpanel says that iOS 12 pre-successor, iOS 11, which has an adoption rate of 10 percent on devices just 24 hours after its launch, Back in 2016, iOS 10 was installed on 14.45 percent of devices within one day, so it indicates that the iOS 12 was indeed not accepted by users for various reasons, perhaps they more concerned about battery life or stay jailbreak iOS 11. 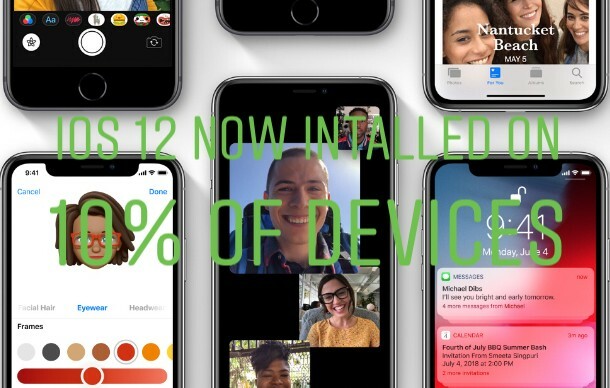 Sure enough, as more and more people updating to iOS 12, iOS 11 adoption will begin to fall as more people adopt the latest software update designed for iPhone and iPad users. As Apple said on WWDC 2018 that iOS 12 will bring significant speed improvements, especially on older devices like iPhone 5s or iPhone 6. Hopefully, the speed enhancements will ring a bell to users who still rocking their devices. In addition to speed improvements, iOS 12 also introduced many highly-anticipated features like Group Facetime that let up to 32 people video call at same time, new Digital Health tool called Screen Time for the purpose of warns you to take a break from using iOS devices, new animated emoji called Memoji, more advanced ARKit 2.0 and new Measure app, Siri Shortcuts for creating custom voice commands, and so much more!